… and I love it here. A lot of people don’t know where Winnipeg is (although they have probably heard of the Winnipeg Jets!). Those who do know where Winnipeg is wonder why I live here and aren’t shy about asking. 1. Winnipeg is just the right size to have everything we need or want: With over 700,000 people, and the capitol city of the province of Manitoba (plus the largest city in the province), Winnipeg has a good variety of culture and shopping and entertainment. My wife and I have lived in smaller towns and definitely felt that annoyance that comes when the town is missing something. Winnipeg is the right size for us. 2. Winnipeg has a good culture of art and education. My wife and I are avid readers and learners. So there are enough bookstores, 20 public library branches (and an excellent business-specific library), 2 universities, a great college, and more. Janelle and I get season tickets to the opera each year. We’ve also attended the symphony orchestra and several plays. That’s the kind of stuff we enjoy and there’s lots of it here. 3. Winnipeg has some great locations around town. 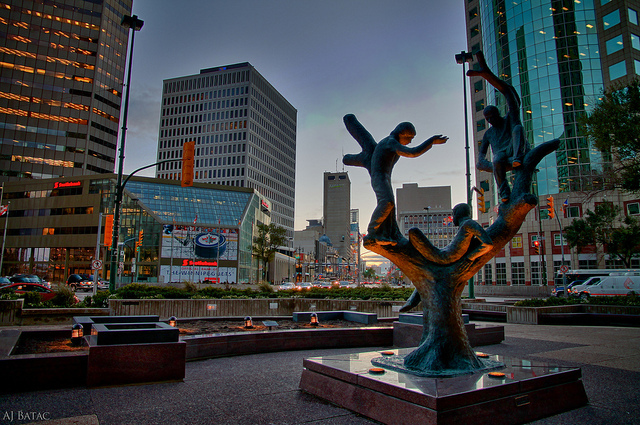 If you’re ever visiting, you need to take in a Winnipeg Jets game, visit Portage and Main, visit the ruins of the Basilica (which is an old stone cathedral that was partially destroyed by fire), walk through the exchange district (the old financial and commerce sector which is now a collection of small shops) and check out The Forks — which is very cool collection of shops and cafes in some stone train warehouses. There are many other things to check out in Winnipeg but those are my favorites. Between this stuff and the books and culture (see the point above), I have no problem at all filling my day with stuff to see and do. 4. The climate is not as bad as people say it is. Winter lasts from the beginning of November to early March, which can seem long to some people but it’s not as long as many people suggest it is. And during the winter, it does get cold at times (even down to an almost-too-hard-to-believe -40, which is -40 in both Celsius and Fahrenheit). But cold snaps like that don’t last long (this winter, the temperature dropped to that level a couple of times for maybe a total of 7 – 10 days… the rest of the winter has been really nice). And guess what: It doesn’t affect me anyway. I work at home. When I need to go out, I can go out in comfort because my SUV is in my garage. The spring and fall are nice, and the summer is hot! There’s also a persistent rumor about mosquitoes, which was a big problem for only a couple of years when Janelle and I first moved here but has become a lot better in the past 5 years or so. 6. Winnipeg has history. I like that about a place. Winnipeg’s history extends back thousands of years to the first aboriginal peoples who would meet here. And when the west was being settled by Europeans, Winnipeg was a central depot and transportation hub. The city has a big financial background, too, and there are still organizations here that are built up from this legacy. From the streets and the architecture and the institutions and the cultures of Winnipeg, you see a rich pattern of history. There was a time when Winnipeg was the cultural center of Canada (nearly a hundred years ago) and it also spawned some great music 40 and 50 years ago (Neil Young, the Guess Who, among others). I think that’s cool. 8. 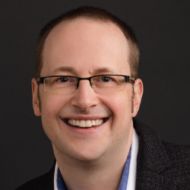 As a business owner, Winnipeg is a pretty good place to own a business: There are plenty of opportunities (for clients, vendors, employees, investment) and great resources for support. I have had a few Winnipeg-based clients both through my financial and real estate freelancing business and my Winnipeg-based technical writing business. I’ve been very happy with running a business here. Sure, I grumble about paying taxes (who doesn’t?) but the taxes aren’t as high as other places I’ve lived. 9. Winnipeg is central. My wife and I like to travel and there are many options for us to start our trip here in Winnipeg. We’re on the TransCanada (which is like the Canadian version of an InterState highway), there’s a great train system (note to self: I want to take a train trip with my wife… one of these days we’ll get around to it! ), and there’s the Winnipeg International Airport which, of course, takes us wherever we want to go in the world (Switzerland and England most recently). Also, we’re a short drive from the US border into North Dakota) and many Winnipeggers drive to the US and fly out of a couple of regional airports. So you can get where you need to go. 10. I’m a contrarian. I like Winnipeg because other people don’t like it. I like finding reasons to like a place that other people hate (even though they don’t have a good reason to do so). 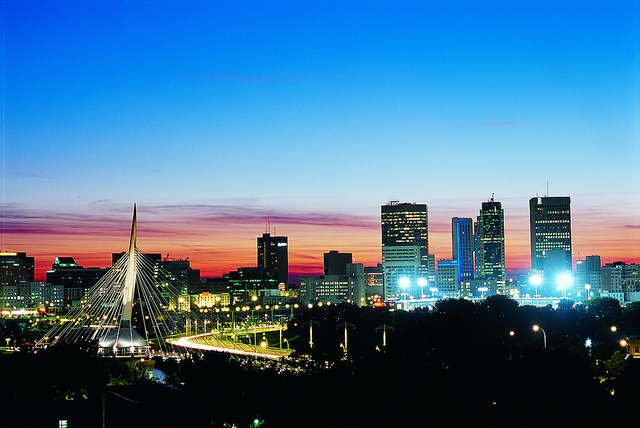 Okay, so you’ve read through my list of 10 of the 11 reasons that I love Winnipeg. And maybe you’re thinking: “Some of those factors will come and go. The economy could take a turn for the worse; maybe there will be a cold snap next year that last the entire winter.” Or maybe you’re thinking that some of the reasons I’ve given are just as true in other places. I know that. I’ve lived in several places and have traveled enough to know that there is good and bad everywhere you go. 11. You make a choice where your home is going to be. This is my home. I choose to enjoy it while I’m here. I’ve lived in several different cities. Each one had its advantages and disadvantages, and each one was disparaged by other people. I’m convinced that you’ll never find a perfect place to live. Winnipeg is, of course, not without its imperfections and frustrations. But you just need to find a place that you’re happy in and call it home. I love it here. Yes things change and there might come a time in life when Janelle and I choose to live somewhere else. But for now we are here. It’s not perfect. But it’s our home and we’re going to enjoy our time here.